The old season isn't quite over yet, but you can already start looking forward to the new one with PES 2018 today confirmed for a 14 September release. Konami's latest festival of goals, saves and Neymar-top-off celebrations is bound for PS4, PS3, Xbox One, Xbox 360 and PC – the latter especially newsworthy, as the Steam version is finally being brought in line with the big boy console versions. 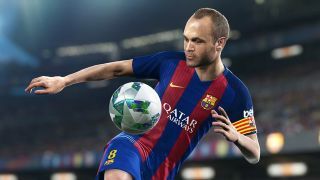 The brains behind the game – a coalition of Japanese devs and Western minds such as brand manager Adam Bhatti – have given themselves a 'Super 7' hitlist of targets for PES 2018. Those significant PC improvements form just one of the seven. A presentation overhaul includes real player images throughout the game's menus, while 'enhanced visual reality' aims to upgrade existing lighting effects, player models and motion capture. An entirely new online co-op mode should appease long-standing fans who still hark back to late night PS2 matches during the dying embers of house parties, but no longer have the time and/or sofa space: both 2-on-2 and 3-on-3 contests can now be enjoyed over the nets. (With additional support for local team-mates and/or opponents.) Solo players are catered for too, as a mini Master League overhaul adds dressing room interactions, pre-season tournaments, and a revised transfer system. I'll pay actual real money for the return of Ximenes and Valery, but no word on that possibility just yet. Additional PES League integration should make it even easier for anyone and everyone to enter Konami's now-annual eSports tournament, but it's the on-pitch improvements which will seal next season's title for either this or FIFA 18. In that regard, we're promised 'strategic dribbling', a more realistic (i.e. slower) pace to matches, subtler stick controls, and a completely revised set-piece system for free kicks and penalties. And yes, you can go backwards direct from the kick-off, at last. One devoted fan recently won $20,000 for being great at PES 2017 – head here to read the full story.